Ex situ collections [rare species held in gene banks, botanic gardens, zoos, or translocation sites] have become recognized internationally as an effective conservation tool that supports in situ, or wild population, conservation of rare plant species. Making living collections is often a first step for further conservation actions, including research and outplantings and as such, is a vital part of an integrated conservation strategy. For many plant species, collections will be an essential part of the recovery and restoration of the taxa. The importance of conservation collections is reflected by its prioritization as a target in the Global Strategy for Plant Conservation, developed by the Convention on Biological Diversity (a global multilateral treaty). To ensure plant diversity is "urgently and effectively conserved", the Global Strategy for Plant Conservation has set a target of securing at least 75 percent of threatened plant species in ex situ collections, preferably in the country of origin, and at least 20 per cent available for recovery and restoration programs by the year 2020. In achieving these conservation goals, members of CaPR follow the guidelines and protocols set forth by the CPC. The most recent iteration of these is CPC's Best Plant Conservation Practices to Support Species Survival in the Wild. Supported by decades of scientific research, by CPC Participating Institutions and others in the field, these guidelines represent best currently known knowledge - but this is ever changing and CaPR members work to keep practices updated as new knowledge emerges. Seed banks are great for conserving the genetic biodiversity of plant species. Thousands of genetically unique individuals (the individual seeds) can be conserved long-term in a relatively small space. These seeds of most species can be kept alive for decades or longer with relatively inexpensive equipment. A single standard chest freezer can house thousands of collections, each with thousands of individuals represented! To optimize conservation of genetic diversity and minimize our impact on wild populations, collections must be done with care. Collectors at each of our institutions follow Center for Plant Conservation guidelines (found above) to achieve our goals. For example, collectors work to collect randomly across a population, not allowing themselves to be tempted in collecting only from the easy-to-reach plants. They also take care not to collect all the seed from any one individual, so that each plant has the chance to leave progeny in the wild. 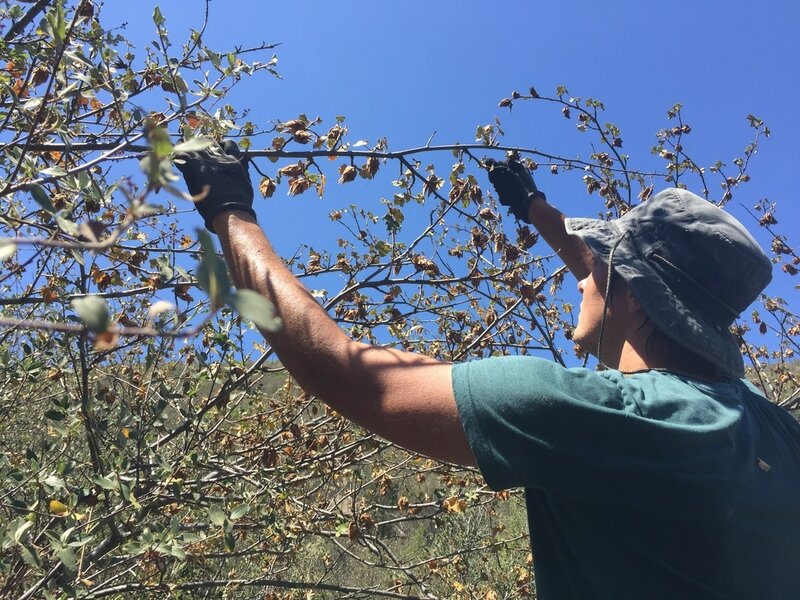 In fact, for federally protected species, permits from regulatory and land managing agencies often limit collections to 5% or 10% of the seed produced by a population or individual. Our rare plant collections are made and curated along maternal lines, that is, we keep seeds from each mother plant separate. This helps ensure broad genetic representation not only at the time of collection, but when the seed is used for research or management purposes. Plants package their seeds in diverse ways to help with the dispersal and survival of the embryos inside. Some seeds are wrapped in tasty fruits to tempt animals to carry them away, others have feathery attachments that allow them to catch the wind and hopefully float to a suitable home; seeds must be separated from these structures, and the other debris from collection to decrease bulk, reduce disease risk, and facilitate future use. Cleaning seeds without causing physical damage and reducing seed viability requires care and expertise, but is also sometimes a process of trial and error to find what works best. Seed cleaning consists of 1) gently breaking apart the seed from other structures, 2) separating the viable seed from the debris. Sieves are used for many species to gently mash the plant material against, allowing the seeds (and some other small material) to fall through the screen. Air separators can also be used to lightly blow away the chaff, leaving the heavy, embryo-filled, seeds behind. If after various methods, the ratio of debris to seed is still high, staff may need to cleaning separate seed from debris by hand. 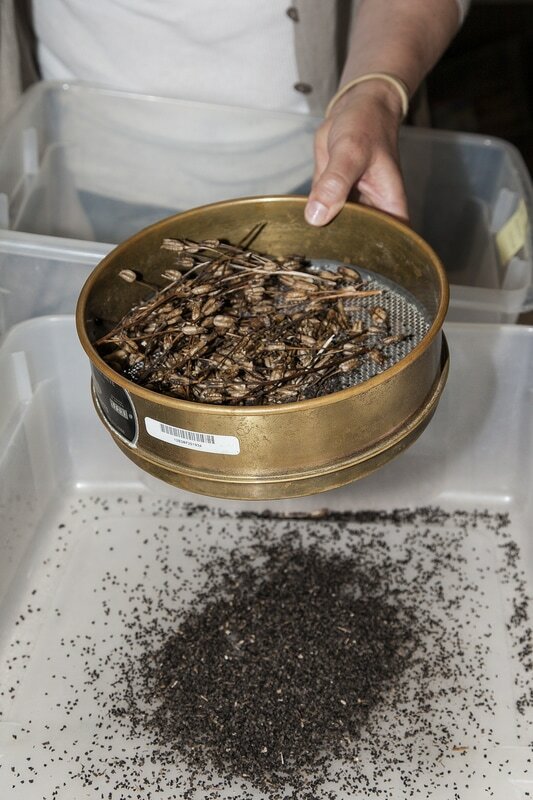 Many seeds can be stored for decades under the proper conditions, serving as an important back-up to the wild populations and providing material for research. Before attempting to store seeds long-term, it is best practice to test the seed tolerance to drying and freezing temperatures – not all seeds are suitable to long-term freezer storage. Seeds that are orthodox need both a dry and cold environment to be stored long-term: the shelf life of a seed can be extended when relative humidity is reduced to 15 - 25% and when temperatures are reduced to 0º F, the temperature of a home freezer. Seeds that are sensitive to drying must be stored under humid conditions or may require special types of culture to be preserved. In-between these two extremes are seeds that may be able to withstand some drying and/or may be able to withstand some chilling. To better ensure conservation of the rare seeds and hedge our bets against facility failures, CaPR collections are split between two sites. About 50% of the seed stay with in a regional seed bank while the remainder is sent to a back-up facility. For rare species, the backup institutions is the National Laboratory for Genetic Resources Preservation (NLGRP), a US Department of Agriculture's facility in Fort Collins. At each facility, about 10% is kept as the "active" seed lot, and is used to test the collection for baseline germination and long-term viability. Not all plant taxa are suitable for seed collections: some seeds do not withstand the drying or freezing process (often referred to as recalcitrant seeds or exceptional seeds) and thus cannot be stored long-term, while others have a low level of seed production (due to having small populations, a loss of pollinators, etc.). For these species, it may be appropriate to keep the species in living collections in nurseries, labs, or on grounds at botanical institutions. Though not as commonly used, conservation collections of living plants is another conservation tool used in the research and recovery of rare plants. Maintaining living collections can require a lot of space and resources and this can limit the number of genetically unique individuals kept in the collection. Still, to conserve the wide breadth of botanical diversity in California, this is an area our initiative is working to expand in capacity. Best practices to ensure maintenance of genetic variability for plants nursery care or field gene banks (or conservation groves) can also be found in the CPC guidelines (above).